The Maps app on your Samsung Galaxy tablet can help you find places in the real world, just like the Internet app helps you find places on the Internet. Both operations work basically the same. Open the Maps app and, in the Search text box, type something to find. You can type a variety of terms in the Search box. Touch the Search button on the keyboard, and the location is shown on the map. The next step is getting directions. If you omit the city name or zip code, the tablet looks for the closest matching address near your current location. Touch the X icon in the Search box to clear the previous search. To find locations near you, have the Maps app jump to your current location. Otherwise, the Maps app looks for places near the area you see on the screen. 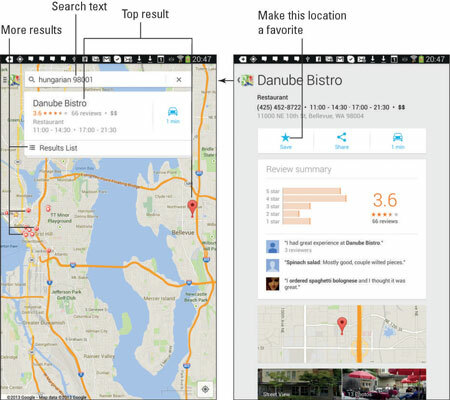 To see more information about a result, touch its card, such as the one for the Danube Bistro. Or choose Results List to see a whole swath of cards. After touching a card, you can view more details. You can touch the Route button on the restaurant’s (or any location’s) details screen to get directions. Spread your fingers on the touchscreen to zoom in on the map. If you really like the location, touch the Favorite (star) icon. That directs the Map to keep the location as one of your favorite places. The location appears as a star on the Maps app screen. Just as you can bookmark favorite websites on the Internet, you can mark favorite places in the real world by using the Maps app. The feature is called Saved Places. To visit your favorite places or browse your recent map searches, touch the Saved Places icon at the top of the Maps app screen. If you don’t see the icon, touch the X button in the Search box. The Saved Places window sports various categories of places you’ve starred (marked as favorites), locations you’ve recently searched for, or places you’ve been. Mark a location as a favorite by touching the Favorite (star) icon when you view the location’s details. The Recently Accessed Places list allows you to peruse items you’ve located or searched for recently. Touch the App icon to return to the Maps app when you’ve finished looking at saved places. You can hone in on where your contacts are located by using the Maps app. This trick works when you’ve specified an address for the contact — home, work, bathhouse, or another location. If so, the Galaxy tablet can easily help you find that location and might even give you directions. The secret to finding a contact’s location is the little Place icon by the contact’s address. Anytime you see this icon, you can touch it to view that location by using the Maps app.